We’ll continue with Cognac today, it’s a family owned house, said to be around 8 years old, mixture of Grande and Petite Champagne, let’s see how it compares with Frapin VSOP we had few weeks ago. 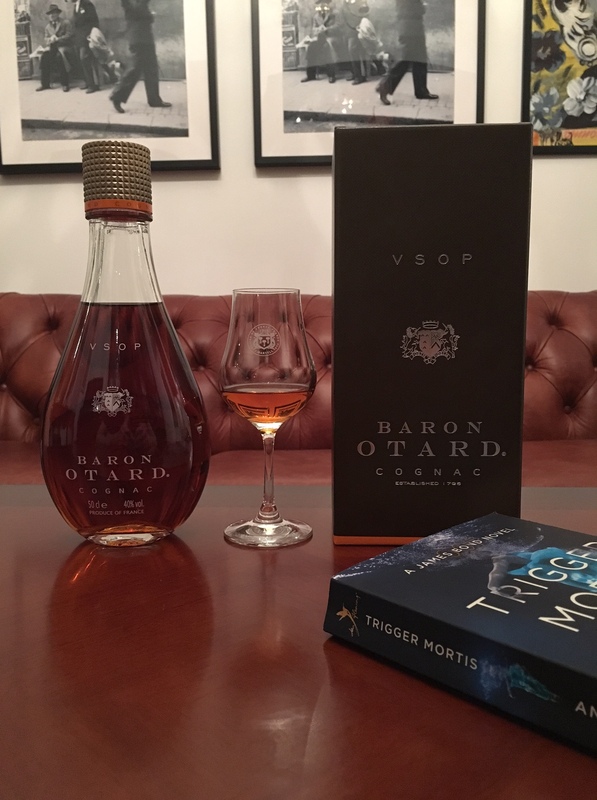 Nose: little closed initially, pear drops, apricot, orange peel, floral notes, also tobacco, tar, it has a better concentration than the Frapin, very enjoyable. Taste: light, vanilla syrup, honey, sweet tropical fruit (apricot, oranges), pipe tobacco, earth, oak, pleasant, little watery but pleasant. Finish: medium long, honey, grass and fresh oak. Comments: simple, enjoyable, it has a similar profile to Frapin but it’s rounder, it has more fruit and it’s not as oaky as the Frapin, that’s worth extra two points in my book, about 81 points. 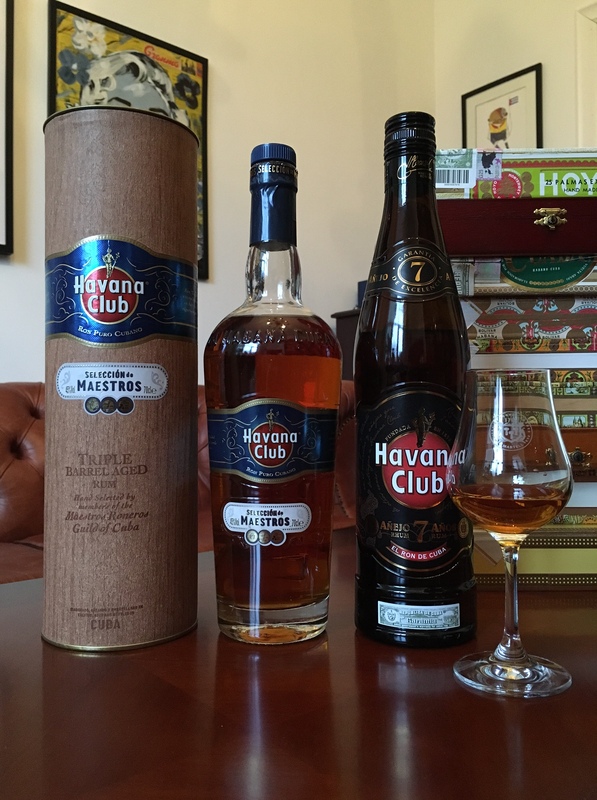 We’ve had quite a few Havana Clubs already, this one is triple barrel aged (whatever that means), it looks to be finished in quarter casks, said to be about 10 years old and bottled at 45%, let’s see how it compares to the 7 year old.. Nose: grass, vanilla, oak, burnt sugar, orange peel, tobacco, cigar smoke, cooking spice, not the most complex nose but it’s very pleasant, more expressive and a touch sweeter than the 7 YO. Taste: good mouthfeel, full bodied, grass, coffee beans, raisins, peaches, apricot, orange marmalade, brown sugar, milk chocolate, leather, some wood bitterness. Finish: long, wood sap, coffee, tinned fruit. Comments: definitely a sipping rum, not too much sugar, quite a bit of wood though, I like it better than the HC7, might be the work of the small casks but it seems older, about 84 points. 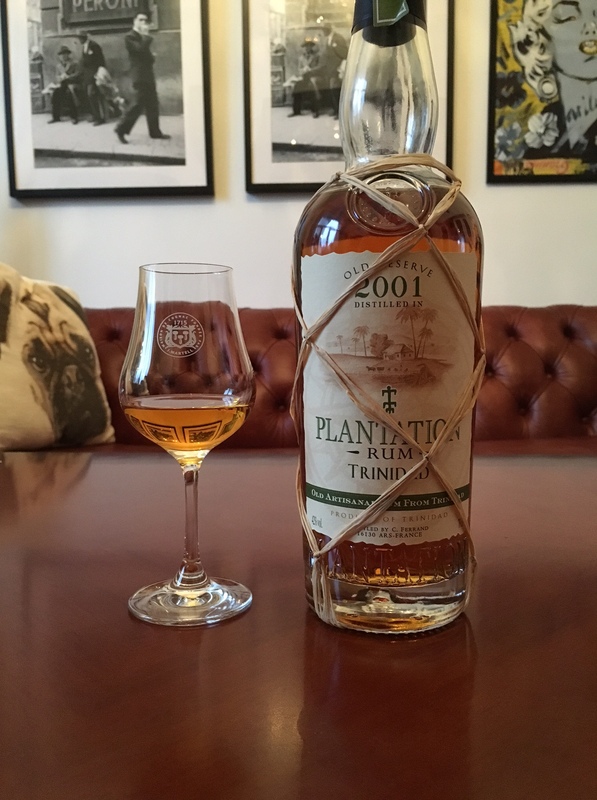 Plantation is a company belonging to Ferrand cognac house, they are sourcing their rums from different makers around Caribbean and bottling these under the Plantation brand, this one is a column still rum from Trinidad, molasses based, I really like the detailed info they provide about their rums btw, aged in ex bourbon and finished in cognac casks. Nose: molasses, coffee liqueur, vanilla, raisins, dried fruit, orange marmalade, some mild smoke, not that complex but very pleasant. Taste: light, quite sweet, again molasses, coffee, orange marmalade, marzipan, coconut maybe, some vegetal notes, wood bitterness, rather straightforward but it works. Finish: long, sweet, tinned fruit, grass, wood sap. Comments: simple, pleasant, rather sweet but not overly so, the oak is maybe a little too obvious for my liking, I think the Mount Gay XO little better, about 79 points. 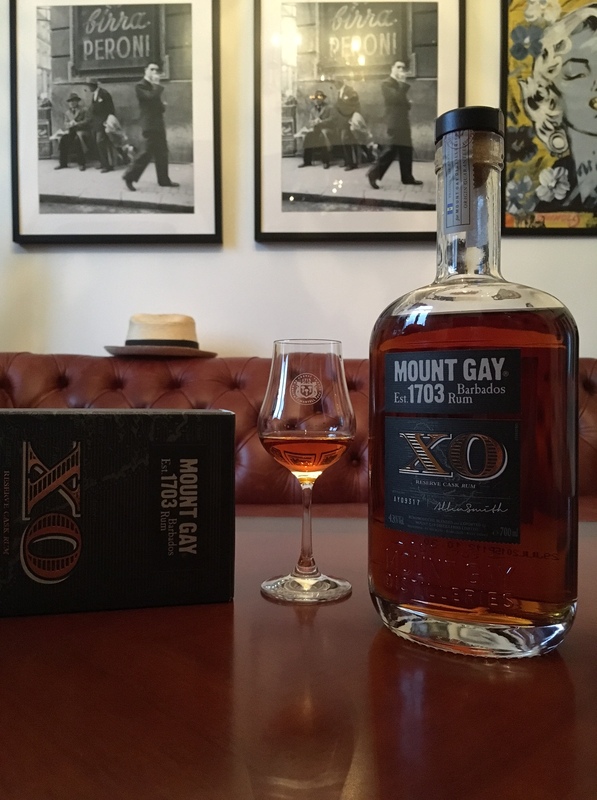 We’ll be having few rums now starting with the Mount Gay Extra Old, it’s probably the best known Barbados rum and known to sponsor many sailing competitions, owned by Remy Cointreau, the XO is said to be around 8 years old, mainly double pot distillates (says so on their web page) aged in ex-bourbon. Nose: molasses, beeswax, vanilla, bananas, pineapple, orange marmalade, coffee liqueur, raisins, dates, cedar wood, furniture polish, very fruity and not overly sweet, very pleasant. Taste: again molasses, vanilla, ripe tropical fruit, apricot, bananas, raisins, almonds, very nice profile, getting very oaky, lots of wood sap. Finish: long, vanilla, grass, wood bitterness. Comments: it’s a British style rum, not too sweet, expressive nose, very nice profile, the bitter finish takes a little getting used to, I like it so much better than the sweet ones I’ve had (Zacapa, Pyrat, etc), I probably like it a little better than my goto rum Havana Club 7 (however it’s also 2,5 times the price), about 80 points. 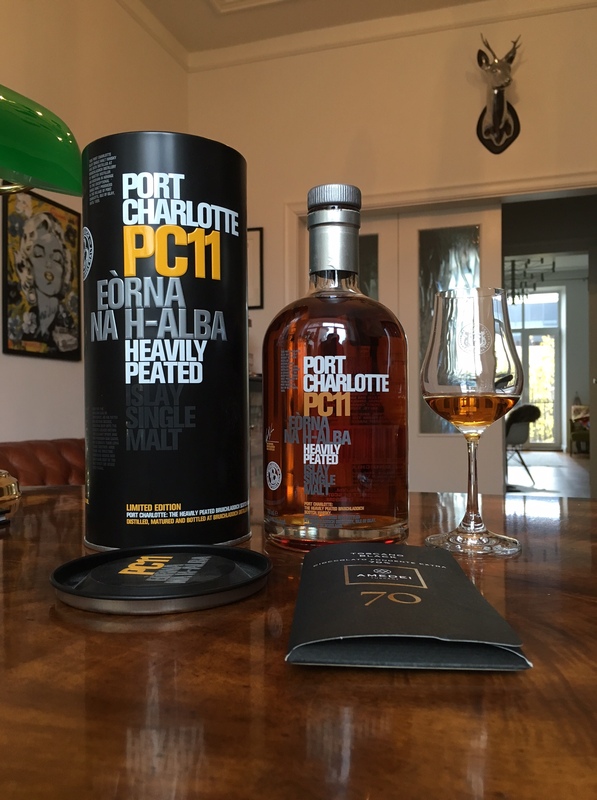 Port Charlotte is heavily peated Bruichladdich, this one is 7th annual release in the Port Charlotte PC series, it’s 11 years old, uses only Scottish barley, 40 ppm peating levels, natural color, non-chill filtered, mixture of ex-bourbon and Oloroso sherry casks and available in travel retail, it’s also bottled at 59,5%! Nose: beeswax, coastal sea air, sherry sweetness, dried fruit, it might be the high strength but it doesn’t seem very peaty, coffee notes, wet dog, dry peat smoke, really well balanced, so much going on, truly an amazing nose, I like it so much better than the Octomore (having them side by side). Taste: big whisky, sweetness, tar, not feeling the strength too much, an obvious sherry influence, raisins, almonds, walnuts, coffee liqueur, chocolate, medicinal, some fish oil, good complexity, super profile and great delivery. Finish: long, iodine, jalapeno peppers, creme brulee. Comments: an amazing whisky, it’s not cheap but it really delivers, needs water, about 89 points, I liked it much better than the Octomore I had few weeks ago. 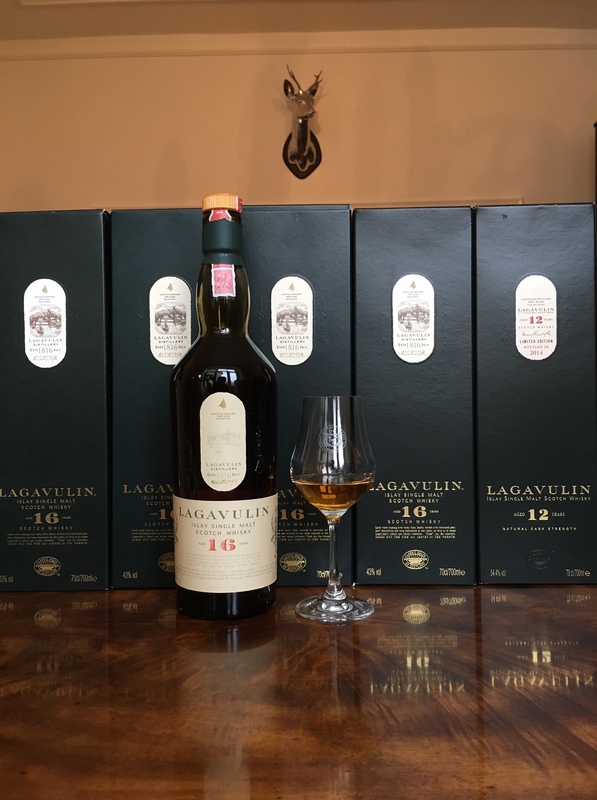 Lagavulin is one of the two Diageo distilleries on Islay with the other being Caol Ila, the 16 year old is usually highly rated, it’s also uncommon these days for the distillery to have it’s entry expression 16 years old, it’s aged on mainland Scotland though (not on Islay). Colour: amber +3, rather dark, not sure if it’s sherried or all colorant. Nose: dense, tar, peat smoke, sweet pipe tobacco, licorice, black tea, salt, sulphur, iodine, nice complexity, sherry notes, sweetness, caramel, dried fruit, elegant, refined, very well balanced, quite amazing, it’s a peated whisky alright but there’s so much going on. Taste: big, pungent, full bodied, there’s salt, peat smoke, orange liqueur, sherry notes, dried fruit, it’s oily, thick, malt sweetness, starting to get drier, black pepper, wood smoke, again it’s really rather amazing. Finish: long, salt, licorice, black tea, dates, oak, cigarette smoke. Comments: probably the best entry level whisky there is these days, the peat doesn’t dominate on any level, very well balanced, has such a nice body, texture, mouthfeel, works so well on so many levels, about 89 points. 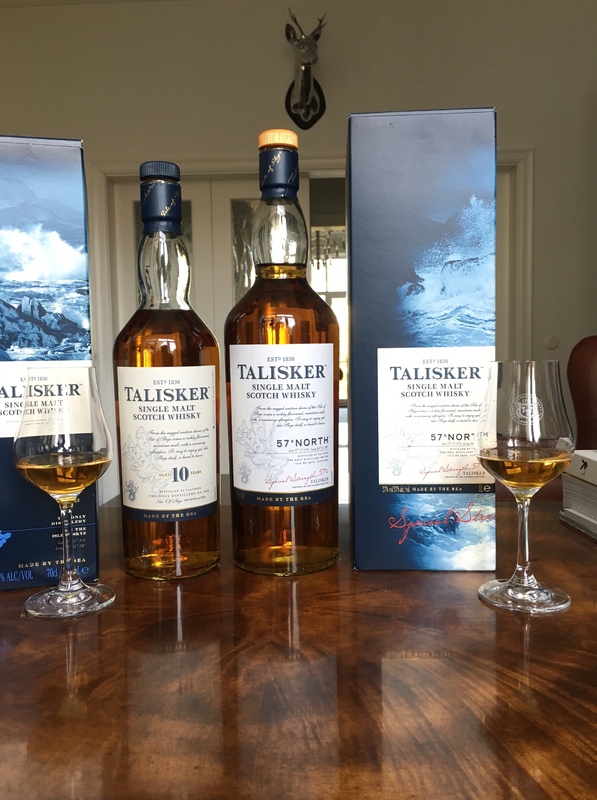 Another expression of Talisker today, this time it’s the 57 North, it’s 57,8%, bourbon re-fill casks, non-age statement, we will be having it side by side with the 10 year old. Nose: intense, vanilla, smoke, pepper, fruit sweetness, antiseptic, rubber, kelp, shellfish, brine, very similar to the 10 year old, it’s sweeter, it’s also edgier, probably quite a bit younger (might also be the strength), 10 year old is rounder and has more complexity, the two share lots of similarities though. Taste: big, intense, full bodied, honey, sweet ripe tropical fruit, then ginger, black pepper, wet concrete, rubber, brine, peat, it’s rather drinkable even at 57%, adding a little water doesn’t change the profile too much, really enjoying this. Finish: very long, copper, vanilla, dry oak, ginger, smoke. Comments: very very good, it is a bit nervous and doesn’t quite have the polish of the 10 year old, when given a choice I’d probably take the 10, it’s still fantastic nevertheless, about 87 points.